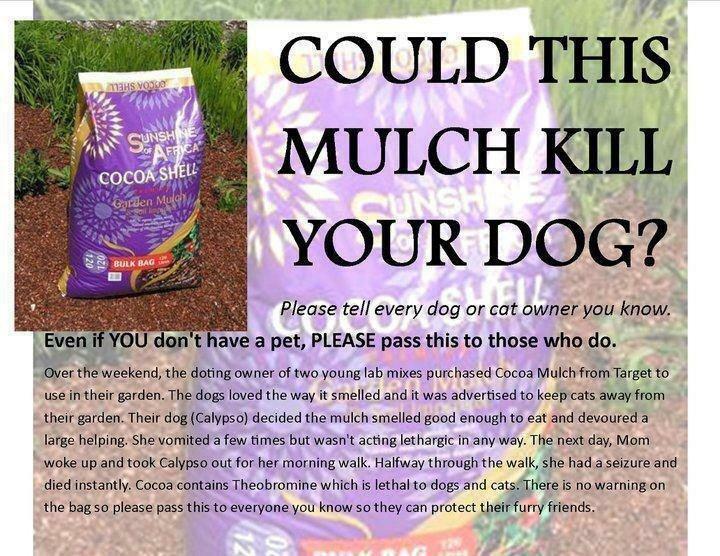 COCOA Mulch can kill your family pet, air on the side of caution. 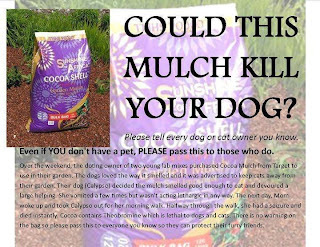 It's better to be aware and over cautious than to lose your beloved family pet due to COCOA Shell or any COCOA Mulch. Animals and chocolate do not mix ! Most types of mulch are safe if ingested by a dog but there is one potentially toxic type of mulch made from the hulls of cocoa beans. Cocoa shells are a byproduct of chocolate-making and contain ingredients similar to chocolate. When this type of mulch is fresh, it even has the aroma of chocolate and when ingested has effects similar to those of chocolate toxicity. Cocoa shell mulch is popular because of its rich dark brown color that can darken more with time. It is most commonly used to help prevent weed growth and maintain soil moisture. Additionally, many believe that it is great for the soil and found to kill slugs and deter termites. Ingestion of large amounts of fresh mulch can result in "chocolate toxicity". 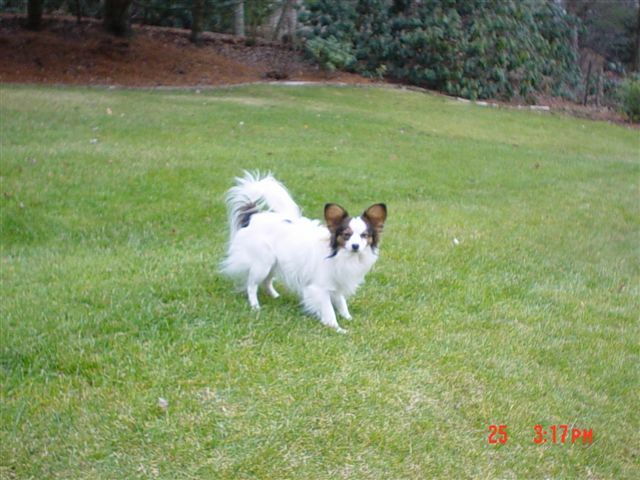 Depending on the toxicity of the mulch and the amount eaten, various problems can occur. Common symptoms include vomiting and possibly diarrhea. Once toxic levels are reached in the body, the stimulant effect becomes apparent at which time you may notice restlessness, hyperactivity, muscle twitching, increased urination and possibly excessive panting. Heart rate and blood pressure levels may also be increased. Seizure activity may occur in severe cases. These signs can occur within a few hours of ingestion. Prompt veterinary care is recommended. Diagnosing cocoa mulch ingestion is generally based on the owner's witnessing or suspecting ingestion and on physical exam findings. The signs are consistent with "chocolate toxicity:" and include pets that are hyperactive, panting, have increased blood pressure and increased heart rates. Dehydration may also occur if there has been significant vomiting and diarrhea. Treatment depends on the severity of the clinical signs and may include continuous intravenous fluid therapy, medications to help control vomiting and sedatives to counteract the stimulant effects of chocolate. Occasionally medication to reduce heart rate and high blood pressure is indicated. Most pets treated for chocolate or mulch toxicity recover and return to normal within 24-48 hours of treatment. But not all. Air on the side of caution and do not use any products with this ingredient if you have pet's. NC House Bill 956 moves to ban agressive breeds in 2014, speak out now before it's to late. NC Residents stand up and be heard. Contact your NC State Legislators now and ask for this Aggressive Breed Ban to be stopped or re-written. As it is now all of these breeds will die the day they make their way into a NC County Animal Shelter as the time to apply for these conditions would expire as you cant do all this in 72 hrs that the Shelter works on. Stand up now before it's too late for all these breeds. I understand this was to reduce dog fighting here in NC and I applaud those efforts with however they forgot to make any provisions for these breeds that end up as strays or lost dogs in our County Shelter System. This would mean death for each one of these breeds that make their way into our County Shelters again as no one has the space to hold them until these conditions are meet. NC wants to push a bill (Senate Bill (S.B.) 648) thru to protect ANIMAL ABUSERS and put the US private taxpaying citizen in jail for exposing inhumane treatment of these Farm Animals. ( And as we all know, people work their way from animals, to children and then to adults). The only winner of a NC Bill like this passing are those who commit these types of hanius acts of cruelty to the animals in their care. Speak out NOW and tell the NC General Assembly that this bill is a BIG NO for our State of NC and we would rather employees of these industries follow humane treatment of animals versus hiding behind an IRON CURTAIN. I wonder if Steve Troxler is behind this bill, esp. Since he’s going around trying to make all these new high dollar deals with China and other Countries? If you want to protect your family from e coli or worse, you will want to STOP this NC AG-GAG BILL. Otherwise in 2014 you will have no idea what you’re eating nor how it was slaughtered before it arrived at your local grocery store. Esp. Now that OBAMA has opened Horse Slaughter Houses here in the USA. Do you know what’s in your meat? Or maybe the better question is if this bill passes will you know what’s in the meat on your plate? I would say, NO ! (2) To capture or remove data, paper, records, or any other documents through 18 duplication, downloading, image capture, electronic mail, electronic transfer, 19 or other means. Wake up, Reach Out to your NC General Assembly Members and STOP this bill. See the ButterBall link at: http://www.wect.com/story/20101297/butterball-accused-of-abusing-turkeys-in-5-north-carolina-plants , or do you need to see more? Labels: Animal Health , ButterBall Turkey , Food Recalls , NC AG GAG BILL , NC Animal Abuse , NC General Assembly , NC General Statues , NC Shelter Rescue , NC Shelter Rescue Inc , Susan Barrett , Susan Barrett in N.C.
Halifax Co opens Animal Shelter to public ( Which BTW was a NC General Statute that they have violated for all these years). So now we are to be thrilled that Halifax County finally is starting to following the NC General Statues? They should of done so all along, versus this pain staking fight by many North Carolina Residents who dealt with this violation and cruelty towards the Shelter Animals from day one. I guess we are to be thankful for small wins for the NC Shelter Animal's however you cant bring back all those animals who died in their care for all those years sight unseen by anyone. And how many were lost family pet's that County Residents couldn't reclaim. Shameful for sure. County Manager Tony Brown recently announced the Halifax County Animal Shelter is open for the public to look at pets for adoption. Brown said the county is working toward many changes he hopes will make the shelter more accessible. Halifax County Environmental Health and Animal Control Director Jeff Dillard said he is looking forward to having a new adoption process in place. Iverhart Plus, a generic equivalent to Merial Ltd.’s Heartgard Plus, is formulated for the prevention of heartworm disease and for the treatment and control of roundworms and hookworms. Stability concerns led Virbac to recall a single lot of Iverhart Max Chewable Tablets in April 2012. A lack of stability can reduce a medication’s efficacy. Veterinarians or pet owners who have questions may contact Virbac Technical Services at 800-338-3659, ext. 3052. CARTHAGE, N.C. (WTVD) -- Moore County Sheriff Lane Carter says his deputies have charged a Taylortown woman with felony animal cruelty after serving a search warrant at a home. Deputies were looking for illegal drugs. They said they also found a dead pit bull in a pen in the back yard on March 27. Animal control officers determined the animal died of starvation. Devonna Patrice Roundtree, 32, of Taylor Avenue, Taylortown, is charged with one count of felony animal cruelty and one count of felony killing an animal by starvation. She had previously been charged with felony maintaining a dwelling to keep controlled substances, and misdemeanor child abuse. Bond for the cruelty charges was set at $10,000. 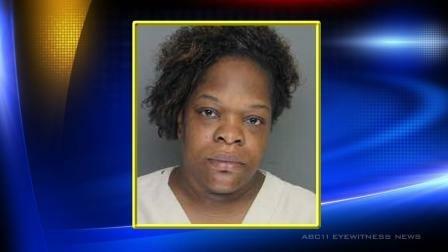 Her next court date is set for April 15. 5. 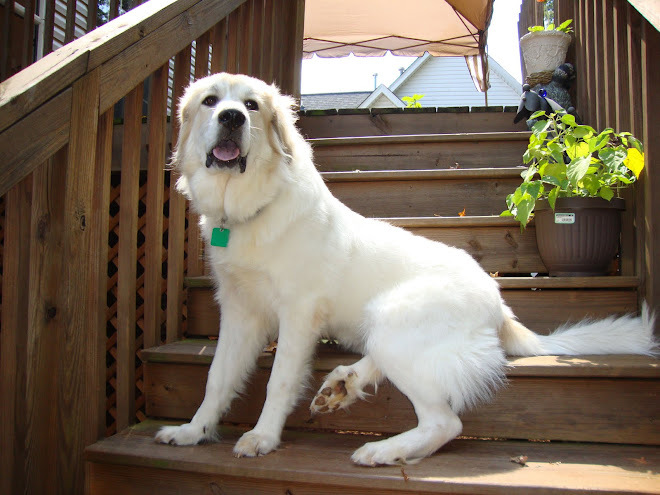 “Can dogs take ibuprofen or aspirin?” The short answer is that they can…but it must be done carefully. Dogs may take either ibuprofen or aspirin under the recommendation of your veterinarian but often in reduced dosages and with special care. It is absolutely critical that you do not give your dog any medication without discussing it with their vet first. FOR IMMEDIATE RELEASE - March 29, 2013 – Natura Pet Products is voluntarily expanding its recall of dry pet food because it has the potential to be contaminated with Salmonella. No Salmonella-related illnesses have been confirmed to date. Sampling conducted by the Michigan Department of Agriculture and the Georgia Department of Agriculture confirmed the presence of Salmonella in additional dry cat food and a cat pet treat. In an abundance of caution, Natura is also recalling product made in the surrounding timeframe. This affects dry foods only; no canned wet food is affected by this announcement. The affected products are sold through veterinary clinics and select pet specialty retailers nationwide and in Canada, Hong Kong, Korea, Japan, Malaysia and Costa Rica, as well as online. The dry cat food expiration dates for this expanded recall range from 1/1/2014 to 3/24/2014. The dry cat treats have expiration dates from 7/1/13 to 9/27/13. Consumers who have purchased these pet foods should discard them. For additional information, consumers may visit www.naturapet.com2. For further information or a product replacement or refund call Natura toll-free at 800-224-6123. (Monday – Friday, 8:00 AM to 5:30 PM CST). Natura Pet Products is recognized as a trusted name behind natural and holistic pet foods and treats. Founded more than 20 years ago by John and Ann Rademakers and Peter Atkins, Natura is dedicated to providing the best natural nutrition. Natura is committed to making premium pet foods and treats based on nutritional science and high-quality ingredients, combined with trusted manufacturing processes, for complete pet health. Lines include: Innova®, California Natural®, EVO®, HealthWise®, Mother Nature® and Karma®. To learn more about Natura Pet Products visit 3www.NaturaPet.com4.